Also known as "plantar fasciitis"
"It's hurt for years. I've tried everything, but nothing lasts." "I can't run through the pain anymore. I don't feel like myself if I don't run. "I've already tried physical therapy and it didn’t help. And after the injections wore off, pain came back worse than before." We specialize in diagnosing and eliminating plantar heel pain , AKA "plantar fasciitis," AKA "the pain on the bottom of your foot." Believe it or not, the pain often originates from the muscles beneath your plantar fascia, rather than from the fascia itself. The key to solving this problem is proper diagnosis of your pain generator (the anatomical structure that is causing you pain), and then specific treatment of that structure. As you've probably experienced, a general or scattershot approach just doesn't work. Check out the video above to understand more about our process. Want to learn more? Enter your information below to talk to our Doctor of Physical Therapy, for FREE, about how we can help resolve your plantar heel pain - for good. You can enter your email or phone, whichever you prefer. We'll be in touch in 1-2 days. Differential Diagnosis: What's causing my pain? Contributing Impairments: Why did this injury happen? Treatment: How can we fix it? Long Term Resolution: I never want the pain to return. If you are reading this, your foot pain disrupts your daily activity. Whether that is the first step in the morning, the morning jog, or gradually increases while standing during the day. A quick search on Google can be less than helpful. Every article points to a different, often conflicting, solution. You've tried them all. Because plantar heel pain is a complex injury. The common diagnosis, plantar fasciitis, is only one of many possible pathologies that can cause pain in a similar, if not the exact same, location. There are many possible pain generators that must be tested and ruled out. This is crucial because the diagnosis changes the treatment. If you have plantar fasciitis, flexor digitorum brevis tendinopathy, fat pad atrophy, neuropathy, or all of the above, how you treat the problem will differ. The diagnosis is the first critical step in healing and returning to normal activity. To illustrate, a fat pad pathology and a plantar fascia pathology will require a different strategy of unloading. The fat pad pathology may require unloading with a cushioned heel cup and a change to a forefoot strike during running, while this strategy would not reduce pain in those with a plantar fascia injury. What are the possible pain generators? How is each ruled in or out? These should be the first and most important questions considered by both the injured athlete and clinician. Otherwise, treatment could be ineffective, or even make the problem worse. Image courtesy of Smith Performance Center, our friends in Tucson, AZ. Plantar fascia: This is the structure you’ve probably heard most about (“plantar fasciitis”). The plantar fascia is a non-contractile tissue that passively helps to control the arch of the foot. Like any other structure, it can become painful when exposed to excessive loading. Although it’s commonly blamed for plantar foot and heel pain, it’s important not to jump to the diagnosis of plantar fasciitis without a thorough examination. We’ve anecdotally found that the muscles and nerves are more commonly the pain generators. Calcaneal fat pad: This is a specialized structure covering the bottom of your calcaneus (your heel bone) that has a unique matrix structure that is designed to take the repetitive impact loading of walking, running, and jumping. It is both broad and thick, allowing it to effectively dissipate force over a large surface area. However, it can be injured, often by either an excessive one-time traumatic load, or by repetitive loading over a small surface area, such as a small pebble in your shoe. Calcaneal stress fracture: The heel bone itself can become damaged. This one is also rare, but is possible particularly in endurance runners. Lumbosacral referral: The structures of your lower back can, in rare cases, cause isolated heel pain that can be misdiagnosed as “plantar fasciitis.” Specifically, an injury at the S1-S2 levels can occassional create pain in your heel rather than your back. This is due to some complex neuroscience, where the brain effectively misinterprets incoming sensory and pain signals. This one is crucial to rule out, as it’s one of the rare times when treating the foot will have no impact on the true problem. In chronic, recalcitrant cases of plantar heel pain, there is often more than one pain generator involved. For example, we commonly see that at least one muscle and nerve are implicated together when pain has existed for more than a few months. This is likely because the nerves run through or immediately adjacent to the muscles in question. As the muscle becomes injured, it is less able to contract and stabilize around the nerve during impact. This creates increased compression, stretch and load through the nerve tissues, which can make them symptomatic. Clinical Side Note: Why do we think that the foot instrinsic muscles are more often to blame for plantar heel pain than the plantar fascia? The question, "what is causing plantar heel pain?" seems to be a difficult question to answer. Is the pain generated due to plantar fascia, nerve, muscle, or something else? The use of the plantar intrinsics is critical for functional movement in gait. The plantar intrinsics stabilize the foot during weight bearing. Therefore, weightbearing on painful muscle can increase pain and could be a contributor to symptoms. The presence of pain causes the foot musculature to become more susceptible to cramping, which may give rise to a cycle of pain then more cramping. A common symptom in patients with plantar heel pain is plantar cramping, which suggests a myogenic cause to the issue. This is in contrast to the plantar fascia, which is a passive structure with no contractile properties, and thus unable to cramp. Anecdotally, we've found that when the clinical exam suggests muscle involvement, and subsequent treatment is directed at the muscle, results are dramatic. This is contrast to the traditional exercises prescribed for plantar heel pain, such as towel scrunches or marble pickups. Repeatedly activating the plantar intrinsics with these exercises can induce cramping and exacerbate symptoms. Sure, we want to retrain the plantar intrinsics, but at the right time during the patient's rehabilitation, and in a way that is symptom-free. Contributing impairments: How did this happen? There are other key factors that must be considered during the initial evaluation. While the pain generator is perhaps the most important piece, the following will paint the picture of how and why your injury occurred and persists. Joint range of motion: Hypomobilities (not enough motion) or hypermobility (too much motion) will affect loads to the plantar structures. The talocrural, subtalar, and mid foot joints must be considered, along with hallux extension and hip and knee function. Extrinsic muscle strength: Assessment of these muscles give us insight into your control of impact loading and ability to absorb force at the time of initial contact. Weakness or inhibition of any of these could be contributing to your problem. Muscles of particular concern are the peroneus longus and brevis, calf muscles, posterior tibialis, anterior tibialis, extensor digitorum longus, and gluteus medius. Volitional intrinsic foot muscle recruitment: In other words, are you able to deliberately contract the muscles of the bottom of your foot? Poor volitional recruitment is linked to your ability to stabilize the foot during dynamic movement. In particular, poor control of the first metatarsal head by the flexor hallucis brevis will drive more load into the flexor digitorum brevis and abductor hallucis. Balance, particularly blindfolded: This is a general indicator of distal motor control and of your ability to regulate and control your position based on feedback from the foot/ankle. Poor performance likely means that the foot/ankle muscles have a reduced ability to attenuate dynamic loads. Gait analysis: Running gait analysis can be a red herring without proper diagnosis. There is so much natural variability to the running stride that it is impossible to diagnose an issue just by watching you run. Gait analysis must be combined with a detailed assessment of your injury history, pain, joint range of motion, muscle strength, motor control, and of course, your goals. 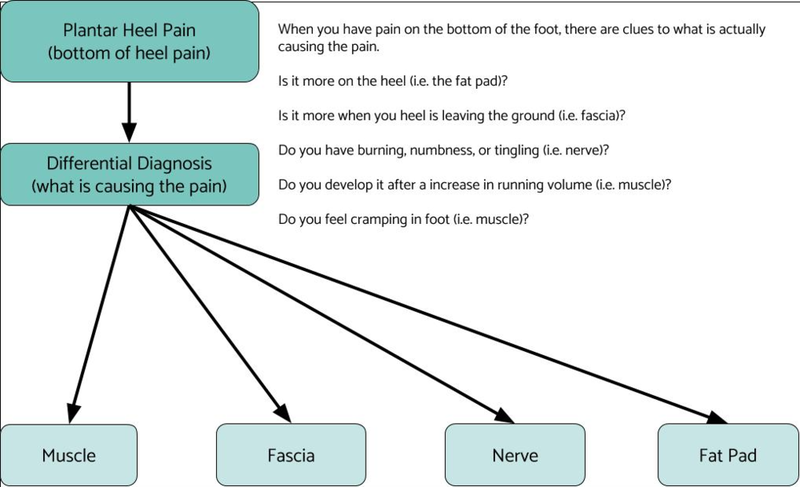 However, there are factors that we have found to commonly be relevant to plantar heel pain. These include: Cadence, stride length, vertical displacement, rate of pronation, and your mid-stance position. Deviations at any one of these will increase loads to the foot. Multiple deviations will have an exponential effect. Once the pain generator and comprehensive contributing factors are identified, the next step is to eliminating pain as rapidly as possible, and stimulate healing. As has been already stressed, all treatment must be diagnosis specific for it to be effective. We want to treat the injured tissue(s) as directly as possible. When this is done correctly, you may be able to experience 80% or more pain reduction in the first visit. Calcaneal stress fracture: Must be confirmed with imaging. Partial weight bearing until pain free is required. Equally important, what do we NOT do during treatment of plantar heel pain? Sell you an expensive orthotic. If treated properly, you have the ability to resolve your pain without any long-term external support. Perform dry needling, or otherwise stick a needle into the bottom of the foot. We think this is painful, traumatic to the tissues that we want to heel, and altogether unproductive. Treat you longer or over more visits than absolutely necessary. In some cases, we have resolved recalcitrant, chronic plantar heel pain in just 1-2 visits. Diagnosis-specific treatment can be that effective. Scoff at your desire to run often, to run high volumes. We get it. We want to help you do your thing. So now, in typically just 1-2 visits, you’ve progressed to the point where you are, potentially, nearly pain free. This is excellent, but you are at risk for recurrence. How to we resolve this issue permanently? This is where the “this sounds too good to be true” story ends. While we can usually get pain under control quickly, there is always real work that needs to be done consistently, over the long term, to ensure a full recovery and prevent recurrence. Unfortunately, 1-2 sessions of manual therapy isn’t enough to fully resolve any issue. Motor control and balance drills: These drills help you to express your muscle strength and proper joint motion. Most injuries cause a reduction in motor control throughout the lower extremity, which, even among the strongest athlete, reduces the ability of muscles to properly control and protect joints. Dynamic force absorption (plyometrics): Again, we want to retrain your ability to attenuate high impact loading. Gait retraining: It’s incredibly difficult to sustain conscious changes in walking or running gait. Even subtle changes take practice to make them become innate. Here’s the good news: Much of this long term work can be built into a running warm up and 1-2 focused sessions of strength training per week. We fully understand that humans are creatures of habit. If we don’t help you to make these preventative steps a habitual part of your routine, then we know they probably won’t happen for long. As we transition you out of our clinic and back to independent training, we want to leave you equipped with the right habits and tools to manage your injury. If you are struggling with plantar foot pain, we would love to help you. Click the button below to schedule a free 15 minute consult.